If you want me to tell it like it has always been, here it is. The thought of studying Shakespeare back at school was scary. I didn't like or appreciate the language. It was difficult to understand and it really got under my skin. I honestly felt like I was being asked to read the bible for my English literature class. However, this is the biggest joke of all; I fell in love with Macbeth and Othello. Macbeth till this day remains one of my favourite Shakespeare texts. The dramatic techniques in that text alone, makes me want to write a new play each time I read it. Othello, you have to fall in love with him, a man of honour and strength, yet so weak and fallible. It goes to show no matter how strong or highly placed you are in life; there is always that one thing something which gets the better of you. In Othello's case, that's Desdemona and if you don't like Iago, I am tempted to ask why. Imago is that colleague who smiles at you but stabs you in the back and b**ch about you. You that one, that's right, there are lots of Iago's around today. One can never be careful... Crafty, vindictive, spiteful and hateful, you name it, he is the real deal. No messing about on that one. Those were the texts of Shakespeare I loved as a teenager and still do. But recently, that has changed. I finally fell in love with the boy from Stratford-Upon-Avon, all over. The Histories, a fistful of plays by William Shakespeare popularly known as the History Cycle, opened in Stratford-Upon-Avon back in 2006 to critical acclaim and rapturous audience response. Back in 2006, I knew nothing about the Histories. I was just another journalist, chasing after my own story and doing what I love to do best, write my plays. You know how we do it, well, come 2007, I get the opportunity to work with the RSC. Low and behold, I finally get the opportunity to see my first Shakespeare production, Henry V. I loved every minute of it. The dramatic action was consistent. The language was beautiful and sounded great. It was eloquently delivered by the actors. It had humour, it had style and above all, was and still is one of the most memorable piece of theatre I have ever seen. It is an event that will stay with me for a very long time. This is the part that blew me, English history will take years to explore but Shakespeare’s ability to capture a period of time within these plays is fascinating and had critics rolling over to get the best angle they could on their reviews. Finally the show comes to London and I have the opportunity to witness the whole cycle of plays in repertoire at the Roundhouse theatre. You bet I didn’t miss a day. 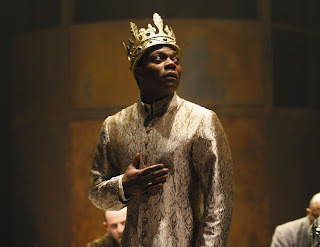 I loved every minute of it - Richard II and III, Henry IV Parts I and II, and Henry VI Parts I, II and III – this was my one opportunity to experience English history with Londoners. To see one man have to suffer and be as helpless as his character was, despite being a king was truly breathtaking. Breathtaking not because he fought back but because the character of the man that he truly is came through to me as an audience member ever step of the way. Crowned king at 9 months old, that’s a job for anyone to take on. Yet he remained true to himself. You could call him an ineffective king because the actions of others move him about and I personally believe his decision making ability is crap. But who is to say, a king cannot have a heart. The level of hatred which existed between the house of York and Lancaster was terrifying. Everyone made claim to the throne. People switched allegiance to the king and each other like they were changing their electricity or gas supplier. I can truly say, without a doubt, this has been one of those moments where you experience a form of theatre you are not used to and you say WOW! I loved every minute of it. The characters, the staging, costumes, lighting, stage design and the music, was marvellous. To sum it up, I was part of history and that is what theatre should always be about. What choice do you have in life when the actions of others constantly shapes your world? How painful is it when you are moved and shook by others but have no say in the affairs of your life. These are some of the questions raised by Celia, a new production from Word of Mouth Media. Soon, Celia’s friendship with Richardson, who takes a romantic interest her, gets her into more trouble than imagined. Young Celia is auctioned off to another owner. Whose actions will forever change the course of her life. A painful journey for any woman, Celia represents the many slave women who endured atrocities against humanity and their womanhood in silence and had no power to change their situation. A tale of beatings and brutality, where men are separated form their wives and children, and women are repeatedly raped by their masters. Even the white preacher’s sermon focuses more on slaves being corrected by their masters rather than the freedom God has allowed for all. Celia is a thought-provoking production that takes you back to a time in history and forces you to examine the actions of man. While Celia is a great story, worthy of the stage and it has its entertaining moments, it lacks direction in areas such as setting, not once is it made clear to the audience where the play is set. If you are not fully aware of the history of slavery, you might have to work extra hard to figure that out for yourself. Though it is not clear if the director’s intent was for the actors to use their British ascent throughout this production, the language was lacking also and overall, the production could have done with more energy. Nonetheless, this is a story worth telling for the sheer courage of one woman to stand up for herself. Levi David Addai just keeps them the plays rolling in. His latest offering, Oxford Street, puts life on one of Britain’s busiest street as it is, onto the British stage. Set in a discount sportswear shop, with characters that are easily recognisable if you have dared to brace one of Europe’s most famous shopping districts. Oxford Street tells the story of Kofi, a university graduate, who dreams of becoming a journalist but for now, he has to settle for the role of a security guard at Total Sports. While he plans the best way to work his way up on the journalism ladder. Kofi gets on with his colleagues and is fond of the fast talking Loraina, who dreams of making it big time in the music industry, claiming, “I didn’t pick performing arts, performing arts chose me.” An all too familiar statement if you have ever had to hold down a part time job while pursuing your dream. His boss, Emmanuel (Cyril Nri) has a soft spot for him. Things are running smoothly until Darrell, an old mate turns up and Kofi has to make some tough decisions. Soutra Gilmour’s ability to turn The Jerwood theatre Upstairs into one of the most vibrant sports shop in theatre has to be commended for the way it replicates life as you know it in any one of the sports shop on Oxford Street on the stage. Dawn Walton’s direction of Oxford Street is lively and without a doubt, a witty and entertaining production that captures a slice of life for what it is. The cast is equally as vibrant. They are not afraid to tell you about their dissatisfaction but they are able to maintain their sense of humour. 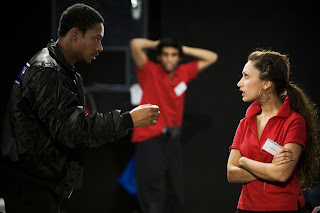 Nathaniel Martello-White is strong as Kofi and Ashley Walters captures the trouble making Darrell superbly. Preeya Kalidas is brilliant as Loraina and Kristian Kiehling is the Polish security guard who takes his job more seriously than life itself but he will make you laugh. Addai’s ability to capture life from the British African viewpoint and posses a voice that tells you about life in London as it is, is to be admired. If this young man continues on this path, this is a name you are bound to see and hear more of on the British theatre scene in years to come. 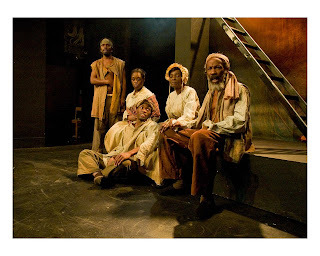 Keeping in tradition with its 2008 season, the Barbican is exposing theatre goers to diverse works from different backgrounds and cultures. As you step into the confines of the Pit, you hear the gentle lapping of waves and the mesmerising background music gets your attention. Produced by The Conch, Vula means Moon in Fiji, and is a production which aims to show the relationship of the people with the water that surrounds them. The stage is transformed into a pool of water and the production starts off with a dancing mat. You are perplexed, wondering ‘how did they do that?’ The cast members come on stage at different points, using dance, puppetry, music and vigorous energy to interpret different rituals of the Island, from the use of mats to flowers to illustrate the relationship between water and the women of the island. Water has never once played such a symbolic role during a stage production. Highly visual, Vula evokes a mystical understanding of nature and has its entertaining moments and is deeply entrancing. This is largely due to the background music which is seductive and hypnotic, and has the potential to put you in meditation mode. However, you can count the number of words spoken on stage and that is where Vula falls short. While the relationship between the women and water is clearly established, it fails to tell you the stories and experiences they hold dearly about that relationship.